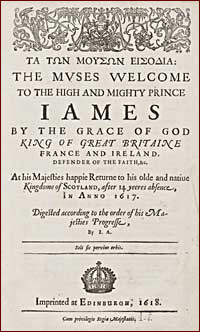 'Muses welcome', with tributes from great poets of the day, commemorated James's visit to Scotland in 1617. 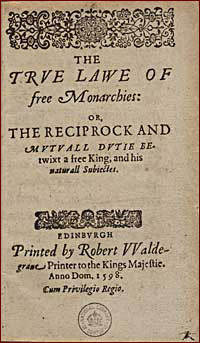 'True law of free monarchies', James VI's book on monarchy. James VI and I started his English reign with all kinds of hopes and ambitions. He saw himself as a scholar-king like Solomon, or at the head of a new civilisation like an early Roman emperor, and leading a united and peaceful British nation. One of his first projects was a full legal and political union of England and Scotland. James told the English Parliament that Scotland would now have to become like an English shire such as Northumberland. However, the English were suspicious of the idea; they were afraid that their Scottish ruler was planning a union that would threaten their identity. To James's dismay, the English Parliament threw the plans out: the only 'union' that they would allow was a union of crowns. One king: two different countries. James found that his other ideas also ran into trouble. He encouraged England to make peace with its traditional Catholic enemies, such as Spain, leading to accusations that he was giving in to 'popery'. His plan for 'civilising' Ireland by means of settling thousands of Protestant Scots in Ulster also generated conflict. James frequently retreated into his own world, hunting, watching theatrical performances and conducting theological disputes with the Pope. His English subjects seem to have been bemused by their king. And what of Scotland? Managed in James's absence by strong nobles and officials, who received frequent messages from James in London, Scotland remained generally peaceful, and maintained its separate system of law and government. James's attempts to make the Kirk more like the Church of England, however, were unpopular, and stored up trouble for the future. The renaissance of Scots literature had been partly snuffed out when the court moved to London: many court poets changed from writing in Scots to writing in English. James only made one return visit to Scotland, in 1617.